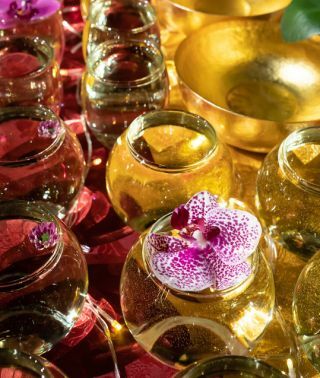 Water bowl offerings on the beautiful altar that was set up next to Lama Zopa Rinpoche’s throne during the teachings organized by Gendun Drupa Center, Martigny, Switzerland, November 2018. Photo by Harald Weichhart. In Tibet this happened: there was a great lama in Amdo, I’ve forgotten his name, who went to the monastery to look for the text on Gyalwa Gyatso. Kirti Tsenshab Rinpoche advised of this. So this lama explained that in Tibet he put up a big tent and then many people made the water bowl offerings together. Then they offered them all together, so that means even though all the water bowls weren’t done by each person, the group counted them together. The lama used this technique in this way to finish them. Therefore, when you make an offering, you can offer even what has been offered by others. 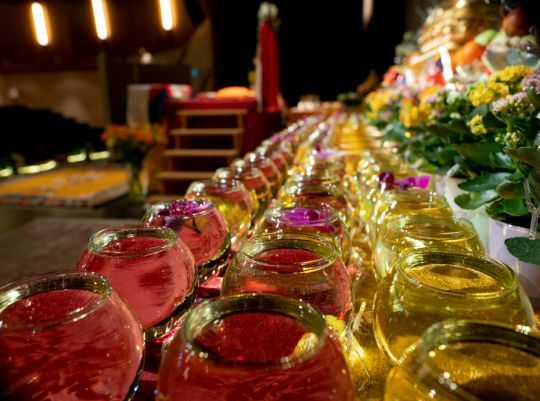 Water bowl offerings on the altar at the teachings with Lama Zopa Rinpoche in Martigny, Switzerland, November 2018. Photo by Harald Weichhart. But for other preliminary practices it isn’t the same. For example, if one person eats delicious ice cream, the other one hundred people or a billion people, or tens of thousands of people or one hundred thousand million billion people, don’t get the benefit of that one person eating ice cream. When the monk does Vajrasattva practice, has everybody in the world done Vajrasattva? When the monk’s stomach is full after eating potato pancakes or eating momos, are all the people’s stomachs in the whole world full? Have they received the same momos or potato pancakes? If so, then it’s OK.